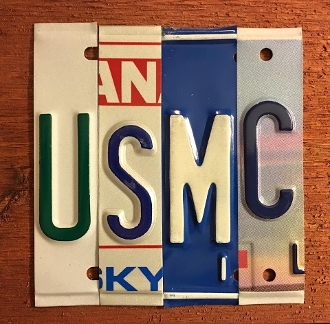 USMC License Plate signs. Our license plate signs are made from recycled license plates that have been retired. Each plate is Unique and no two are ever the same. We never use numbers for letters and we don't use roadkill or rusty plates. The letters are mounted onto stained rough cut cedar with a sawtooth hanger on the back. Please include your cell number and we will send a picture text of the letters for your approval bfore completeing your sign. An anchor can be added at no extra charge just be sure and check that option. The two letter rate for your Sailor can be added for free as well. Just put a note in the special instructions that you would like that added and what the two letters are such as AO for Aviation Ordnanceman or MP for Military Police etc. The sign shown is an example and has not been screwed to the board. It will be screwed and have end pieces added to it.